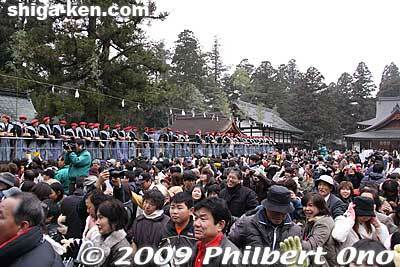 Golden Week is Japan’s spring vacation from late April to early May with a string of national holidays. April 29 is Showa Day, May 3 is Constitution Day, May 4 Greenery Day, and May 5 Children’s Day. It is prime time for matsuri festivals in Japan and Shiga has a load of them. There are so many matsuri in Shiga during this time that it took me at least 4 or 5 years to see most of them because many are held at the same time. You really have to decide which one to see. Here is a collection of my video clips (in varying quality) of Golden Week festivals I recommend seeing. A wide variety for sure. 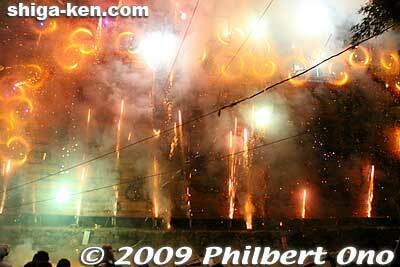 May 4: Shinoda Hanabi in Omi-Hachiman. Intangible Folk Cultural Property. Omi Hino Shonin Furusato-kan entrance. Last month in September 2015, I got a sneak peek and taste of a new Japanese dining experience that will start later this month on Oct. 20 at the Omi Hino Shonin Furusato-kan (近江日野商人ふるさと館) in Hino. This is the former grand residence of Hino merchant Yamanaka Shokichi (旧山中正吉邸) that has been restored to serve as a local museum and community center. It is right on the road leading to the entrance of Umamioka Watamuki Shrine. Main house. Kami-dana Shinto altar on upper left. Yamanaka Shokichi was a Hino merchant born in 1809. He became a sake brewer in Shizuoka Prefecture. 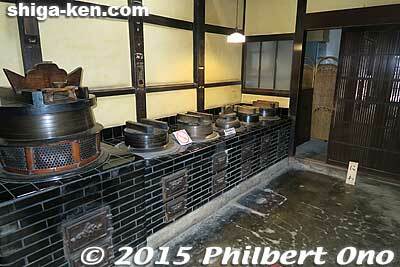 By the 1920s, his family became one of Shizuoka’s most successful sake brewers. Out of all the Hino merchant homes open to the public, this is one of the largest and grandest. It was purchased and restored by Hino Town (taking two years) and opened to the public on April 1, 2015. 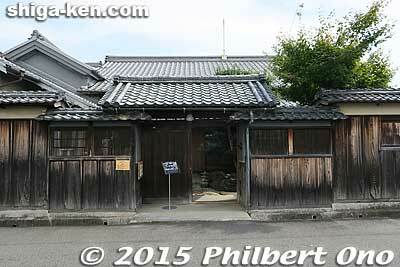 It preserves Hino’s historical and cultural artifacts and serves as a local information center. 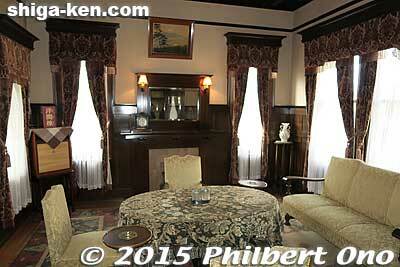 They are still installing panel displays and fixing up the place, but much of the home is open to the public. Hats off to everyone who helped with the restoration. An amazing job as far as I can tell. The home is within a large 1,300 square-meter plot originally bestowed by the local Nishioji lord to the Yamanaka family. The home was built in the late 19th century. The floor plan of the main house follows the typical layout of a farmer’s house with four rooms shaped together in a square (四間取り). Later in the 1920s-30s, a “new” Japanese-style living/guest room, a Western-style room, and Western-style bath/shower were added to the main house. Quite a magnificent home, not to mention the intricate transoms. Japanese-style room with garden view. Where we had lunch. 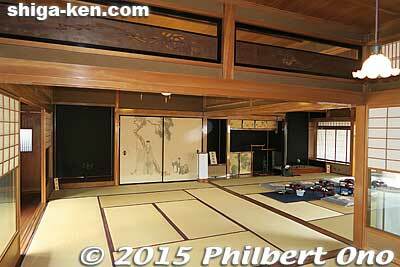 The home’s largest room is the Japanese-style living room with 12 tatami mats. 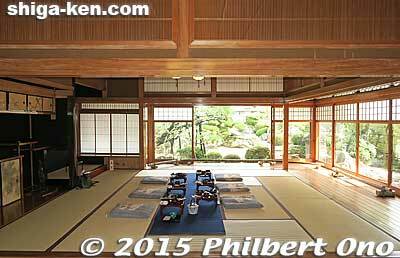 It is in the Sukiya shoin-zukuri style complete with a tokonoma (alcove) and superb view of the Japanese garden right outside the veranda. This was where we had a fabulous Japanese lunch (see photo). 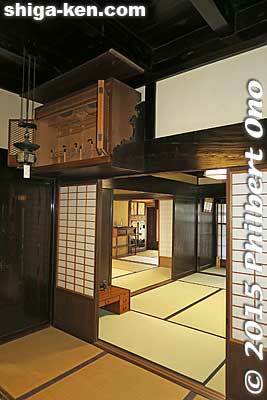 The room adjoins a 10-mat room so without the fusuma sliding doors, it becomes a spacious 22-mat room. And next to the 10-mat room is a 6-mat room. Very nice. Lunch with locally grown vegetables (tempura, pickles, etc.). Maki-zushi had a flowery design. Chicken-ham had ume plum sauce. Dessert on the right was fig compote. For ¥1,500, a feast it was. Our lunch was prepared by a group of local ladies calling themselves the “Society for Continuing Traditional Cuisine” (伝統料理を継続する会). They use locally grown vegetables and other ingredients made in Japan. They say that everything is “wholeheartedly handmade.” Yep, we could definitely see and taste it too. 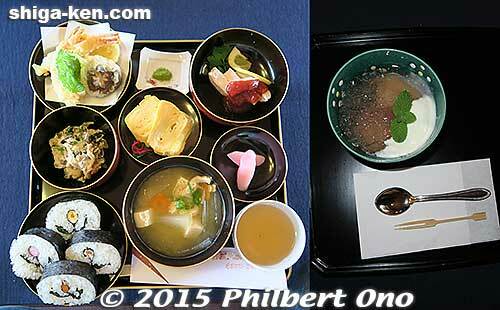 The food was served in 100+ year old lacquer bowls. Reservations are required to have lunch here. Prices are affordable, starting at around ¥1,500. Would be an elegant place to have a luncheon or reception. Garden outside the Japanese-style room. The Omi Hino Shonin Furusato-kan is open from 9 am to 4 pm, closed on Mondays and Tuesdays (open if a national holiday), the day after a national holiday, and Dec. 29–Jan. 4. The home is right on the road going to Umamioka Watamuki Shrine. From Omi-Hachiman Station or Hino Station, take the bus bound for Kitabatake-guchi (北畑口) and get off at the Mukaimachi (向町) bus stop. Or take a taxi from Hino Station. Parking is also available behind the home. *Special thanks to Austin Moore for arranging our visit to Hino. This page will be updated with new events as the winter weeks go by. 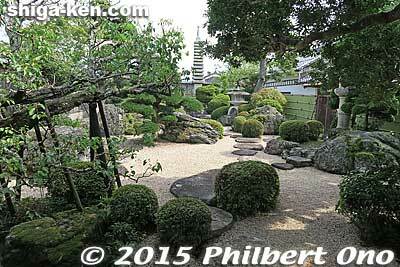 Shiga has a number of plum blossom gardens. 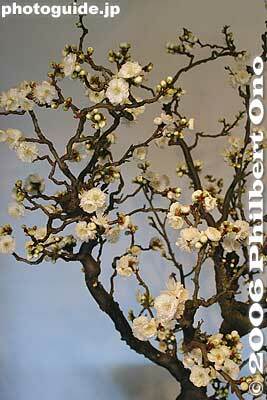 See this post for a list of plum blossom gardens in Shiga. Taga Taisha Setsubun bean throwing on Feb. 3. 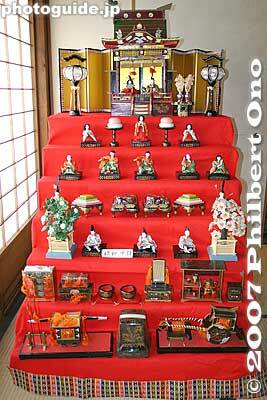 ♦ Hina-matsuri dolls (雛祭りの雛人形) are being displayed at various locations in Shiga to celebrate Girl’s Day on March 3. On the weekend of Feb. 15-16, 2014, Gokasho in Higashi-Omi is having a unique event of live hina dolls called Ningen Hina-matsuri (にんげん雛まつり). Yes, they are real girls, ten of them, dressed as Hina dolls. 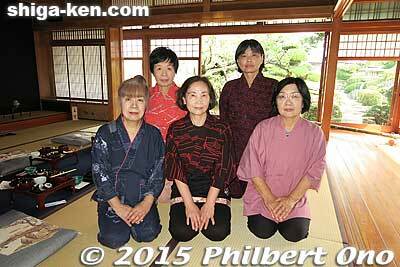 They will appear twice on both the 15th and 16th at 10:00 am to 11:30 am and at 1:30 pm to 3 pm at the Omi-shonin merchant home of Tonomura Shigeru (外村繁邸). 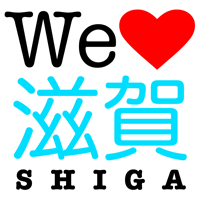 Held annually to promote Shiga products in Tokyo, numerous food booths and crafts are displayed and sold. Hiko-nyan will also appear on March 1 and 2 at 12 noon and 2 pm on the rooftop stage.